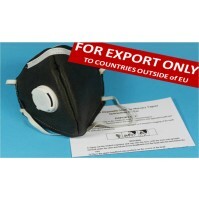 Mercury Vapour-Proof Mask NOTE: NOT AVAILABLE FOR CUSTOMERS WITHIN EUROPEAN UNION Main features: Filters mercury vapour for 150 hours at 2x TLV limit - that's a month of daily use Mercury vapour filtration performance proven in independent testing Original design using established multi-layered activated carbon cloth Removes aerosols and particulates to 0.3 micron - categorised a.. 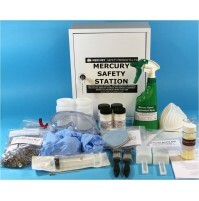 Harmful mercury vapour is released from mercury spillages, broken fluorescent lamps or from industrial work areas where mercury-rich dust can accumulate, such as in flat screen electronic recycling facilities. 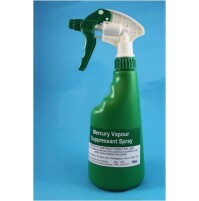 Anywhere that mercury vapour release is a risk to health, this product will prevent mercury vapour from escaping into the atmosphere. 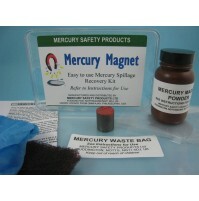 It does this by coating the source of the va..
Refill Chemical Packs x10 Bulk pack of 10 chemical refill packs for type HK mercury spillage kits. 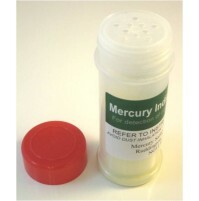 Contains both microfine sulphur and calcium hydroxide for use as the absorbent powder mix and in decontamination slurry. Will extend the shelf life of the kit for another 3-4 years after expiry. 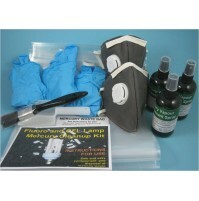 Intended for multiple users such as in the hospital or industrial setting. H..